In Buddhist thought, a bodhisattva (Simplified Chinese: 菩萨; Traditional Chinese: 菩薩; Hanyu pinyin: púsà; Japanese: 菩薩 bosatsu; Korean: bosal) is a being who is dedicated to assisting all sentient beings achieve complete Buddhahood. Conventionally, the term is applied to hypothetical beings with a high degree of enlightenment. Bodhisattva literally means a «wisdom (‘bodhi’) being (‘sattva’)» in Sanskrit. 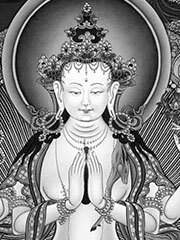 In Theravada Buddhism, the bodhisattva (Pali: bodhisatta) is seen as seeking enlightenment so that, once awakened, he or she may efficiently aid other beings with the expertise of supreme wisdom. Gautama Buddha‘s previous life experience as a bodhisattva before Buddhahood are recorded in the texts of the jataka. Lay Buddhists of Theravada seek inspiration in Gautama’s skill as a good layman in these texts, which account not only his historical life, but many previous lives. When Gautama Buddha referred to himself in his pre-Buddha existence, he spoke in terms of «when I was still a Bodhisattva». The only currently active bodhisattva described in the Pali Canon is the future Buddha Maitreya (Pali: Metteyya). The Theravada tradition, i.e., the Pali Canon, speaks of no other bodhisattvas than these. In Mahayana Buddhism, a bodhisattva has the compassionate determination to aid all beings on their quest for the highest state of development, full enlightenment of a Buddha. This type of motivation is known as bodhicitta. Remaining in this world of uncontrolled rebirth (samsara), the Bodhisattva has taken the bodhisattva vow to achieve Buddhahood as quickly as possible and thereby be most able to teach Dharma until all beings have likewise achieved enlightenment. Another common conception of the Bodhisattva is one who delays his own final and complete enlightenment in order to save all sentient beings out of his enormous compassion. He is on a mission to liberate all sentient beings, and only then wil he rest and complete his own enlightenment. In brief, simply imagine the Bodhisattva as saying, «If I know how to swim, and even one other being cannot, then it is right to remain behind in this world to assist them until they know how to save themselves from drowning». Mahayana Buddhist philosophy sometimes poses the concept of the bodhisattva in opposition to that of the Sravaka-Buddha (conventionally referred to as an Arhat). The Arhat is seen as being possessed of ultimate enlightenment, but he did not choose to save all and every other living being before passing away into Parinirvana. According to many traditions within Mahayana Buddhism, on his or her way to becoming a Buddha, the bodhisattva proceeds through ten, or sometimes fourteen, stages or bhumi. Below is the list of ten bhumis and their descriptions from The Jewel Ornament of Liberation, a treatise by Gampopa, an influential teacher of the Tibetan Kagyu school. Other schools give variant descriptions. the path of preparation (gate). It is said that being close to enlightenment and seeing the benefit for all sentient beings, one achieves great joy, hence the name. In this bhumi the bodhisattvas practice all virtues (paramita), but especially emphasizing generosity (dana). In accomplishing the second bhumi, the bodhisattva is free from the stains of immorality, therefore, this bhumi is named ‘Stainless’. The emphasized virtue is moral discipline (śila). The third bhumi is named ‘Radiant’, because, for a bodhisattva who accomplishes this bhumi, the light of Dharma is said to radiate from the bodhisattva for others. The emphasized virtue is patience (kṣanti). This bhumi is called ‘luminous’, because it is said to be like a radiating light that fully burns that which opposes enlightenment. The emphasized virtue is vigor (virya). Bodhisattvas who attain this bhumi strive to help sentient beings attain maturity, and do not become emotionally involved when such beings respond negatively, both of which are difficult to do. The emphasized virtue is meditative concentration (dhyāna). «By depending on the perfection of wisdom awareness, he does not abide in either saṃsāra or nirvāṇa, so it is ‘obviously transcendent'». The emphasized virtue is wisdom (prajña). Particular emphasis is on the perfection of skillful means, or upaya-kaushalya, to help others. The emphasized virtue is aspiration. This, the ‘Immovable’ bhumi, is the bhumi at which one becomes able to choose his/her place of rebirth. The emphasized virtue is power. The emphasized virtue is the practice of primordial wisdom. After the ten bhumis, according to Mahayana Buddhism, one attains complete enlightenment and becomes a Buddha. Various traditions within Buddhism believe in certain specific bodhisattvas. Some bodhisattvas appear across traditions, but due to language barriers may be seen as separate entities. For example, Tibetan Buddhists believe in Chenrezig, who is Avalokitesvara in India, Kuan Yin (other spellings: Guan Yin, Kwan Yin, Quan Yin) in China, and Kannon in Japan. A modern bodhisattva for many is the 14th Dalai Lama, considered by many followers of Tibetan Buddhism to be an incarnation of that same bodhisattva, the Bodhisattva of Compassion. The bodhisattva is a popular subject in Buddhist art. The place of a bodhisattva’s earthly deeds, such as the achievement of enlightenment or the acts of dharma, is known as a bodhimandala, and may be a site of pilgrimage. Many temples and monasteries are famous as bodhimandalas; for instance, the island of Putuoshan, located off the coast of Ningbo, is venerated by Chinese Buddhists as the bodhimandala of Avalokitesvara. Perhaps the most famous bodhimandala of all is the bodhi tree under which Shakyamuni achieved buddhahood. Some, mainly American convert Buddhists including Jack Kerouac, are recently incorporating Jesus into Buddhism by claiming he is a bodhisattva. The band Steely Dan has a song entitled Bodhisattva on their 1973 album Countdown to Ecstasy. The rap group The Beastie Boys has a song called Bodhisattva Vow on their album Ill Communication.